There is huge potential in the Tesla powertrain. 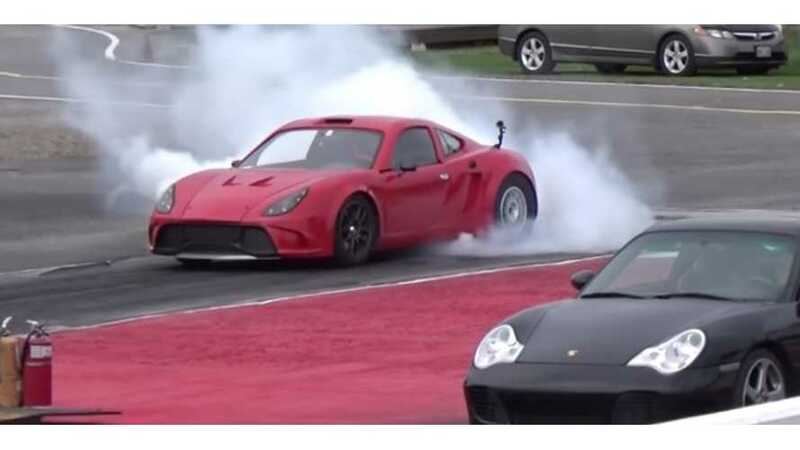 A converted 818 kit car that normally houses Subaru WRX components, now equipped with a Tesla P85 rear-wheel drive unit, has become one of the quickest EVs, achieving a 10.155 seconds @ 126.37 mph performance result on the quarter mile. That's much improved over even the 10.7958 seconds recently posted by the new Tesla Model S P100DL itself! In this case, the size, and more importantly the weight, of the production Tesla prevents it from hitting the low 10 seconds. The author of the conversion adds that he believes by next Spring his DIY EV will go below 10 seconds. Power is supplied via two sets of original/gen 1 Chevrolet Volt batteries (32 kWh total) to power the beast. We swapped the S85 tesla drive unit for a P85 drive unit, installed larger drag radials and this is the result. Had to modulate the power on launch for all the runs, so on a race prepped track a high 9 second pass should be possible. Includes in car video." "The batteries (two chevy volt battery packs in parallel ~32 KWh) have been performing beautifully. They sag less than a Tesla 85KWh pack at the same power level according to my logs so far. I will be doing a range test next week, I expect something over 200 km." "10 second Tesla powered 818. This is the second time out for this car, this time with drag radials. We were traction limited last time, but that problem is solved with these tires. The car's trap speed is still limited by gearing, due to the fact the Tesla drive unit is geared for much taller tires that will not fit on this car. The car is currently running an S85 (not P85) drive unit, with two chevy volt battery packs wired in parallel, a chevy volt charger and DC/DC converter, Subaru STI brakes and custom axles. We control the drive unit, charger and DC/DC converter with our own software and hardware that we designed in house. Car has just over 200 km's or range. We brought a P85D to race against this time for fun."